I was long overdue for a new bench, coming off a solid core door on Fir 4×4s for the last eight years. I spent a long time thinking about this and gathering materials. The first thing I purchased was the Patternmaker’s vise. 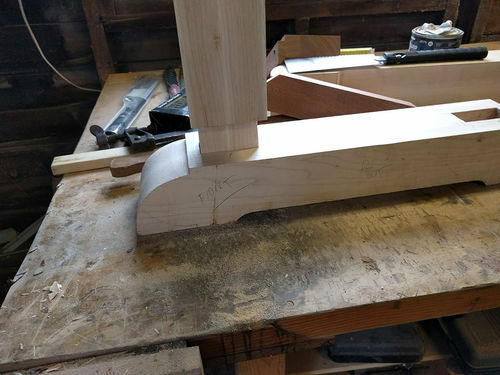 The bench top is 5” thick Hard Maple roughly 8’ long X 29” deep, by 38” tall (I’m 6’1”). 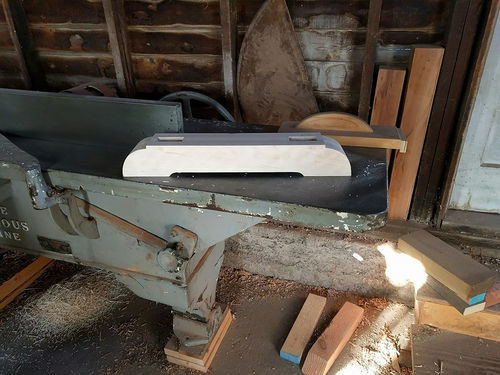 I chose the Hovarter wagon vise after extensive research. I wanted a traditional looking hub/handle (rather than a handwheel) but I wanted the working components of the vise to be of modern technology, i.e. no wooden screw threads to crack or swell, etc…. This vise is pretty slick and extremely easy to install. With the handle in the unlocked position, the dog block can be slid anywhere in the cavity. 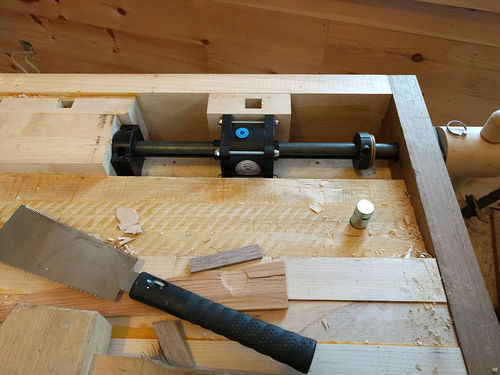 Push the dog block up to the workpiece, and then a quarter turn of the handle locks it snug. The trestle is a fairly classic design – 4X4 Maple legs and trestles, hand cut mortise and tenon joinery. Walnut wedged through tenoned stretchers. Handcut Houndstooth dovetailed end caps. I’m pretty happy with the result and look forward to many years of inspired work on it. That’s a beauty, solid and heavy! Great bench. Last year I purchased alao a patternmaker’s vise and I.m very glad with it. Good choice. Beautiful, beautiful, just plain beautiful. And I love the shop wall … Alder? The shop wall is shiplap Pine. This is actually the back wing of my house that I have yet to finish. 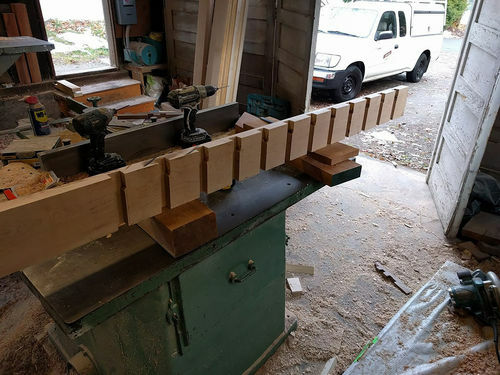 It will become my bench room for lutherie. Have “rough work” shop out in the garage. 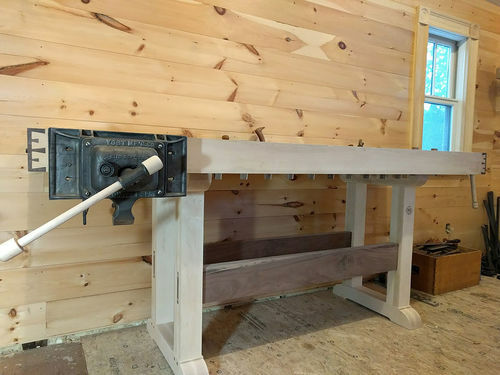 Beautiful bench and that’s an interesting wagon vise – this is the first that I’ve heard of the company, but the features/price point is interesting. Let us know what you think of the hardware after living with it for a while! OK, I’m jealous, big time. You should post this in the workbenches of your dreams thread. They will love it. And you will get questions on your Hovarter vise. There was a good discussion on that vise hardware 6+ months ago. That’s fantastic. I just love the black walnut. A great looking bench. The bench is a beauty. But gotta be honest that big cast iron vice…not so much. I understand you selected that vice for it’s functionality. 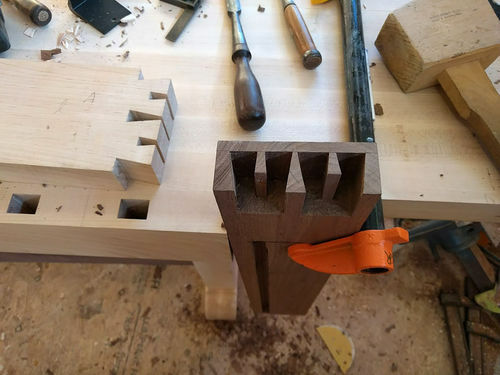 But a bench is often a design and built to show off the craftsmans ability. For instance you wouldn’t put truck wheels and tires on luxury auto, yea they work but do they look good and function well? Anyway, just my opinion. I do appreciate your bench and the work you put into it. -- Ken, USAF MSgt, Ret. 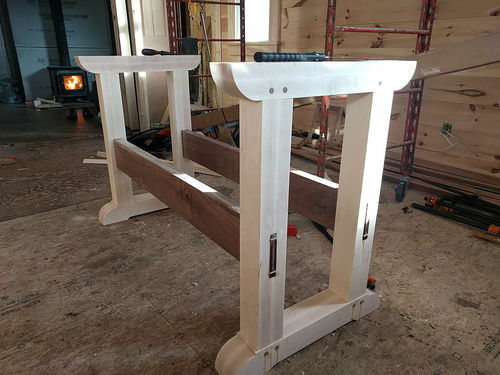 Beautiful bench and that s an interesting wagon vise – this is the first that I ve heard of the company, but the features/price point is interesting. Let us know what you think of the hardware after living with it for a while! Thanks. It’s strange that Hovarter does not come up in any kind of Google searching for vise hardware. 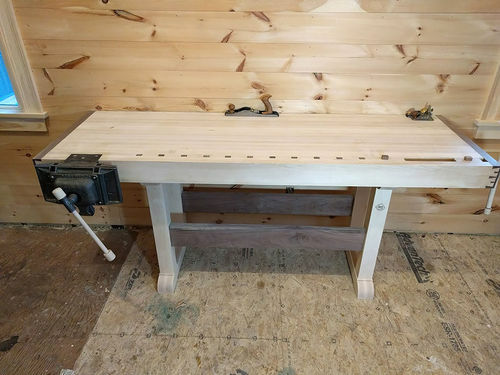 I was incredibly close to buying either the Lie-Nielsen tail vise, or the Benchcrafted wagon vise. Somehow in my last search, I came across some post in a forum that mentioned the word Hovarter in context of vises. I called the company, the owner himself answered the phone and answered my questions. For $100 less than the other two, and with all the features I wanted, it was the clear winner and I ordered it instantly. Time will tell how it holds up. Thanks. It s strange that Hovarter does not come up in any kind of Google searching for vise hardware. 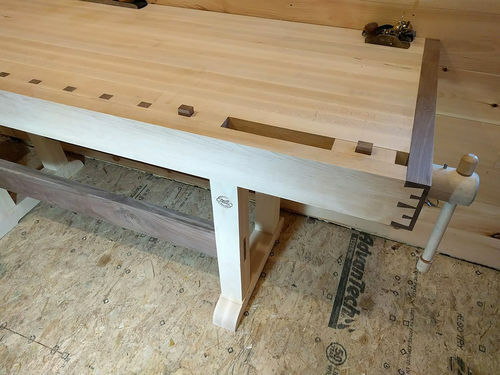 I was incredibly close to buying either the Lie-Nielsen tail vise, or the Benchcrafted wagon vise. Somehow in my last search, I came across some post in a forum that mentioned the word Hovarter in context of vises. I called the company, the owner himself answered the phone and answered my questions. 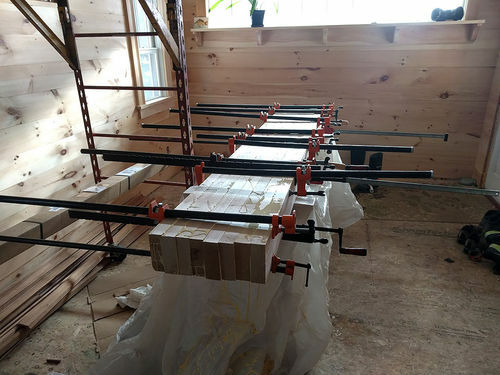 Looking at the installation instructions, it looks as if it would be a much easier install than the Benchcrafted wagon vise, which requires a certain amount of precision with the rails, etc. Did this go in as easily as it looks like it would? I will say the pricing is not quite as attractive as I’d initially thought, since the lever/hand wheel isn’t included with any of the kits, but it still comes out to be less (or at least competitive) and the speed of adjustment is pretty killer. I will say the pricing is not quite as attractive as I d initially thought, since the lever/hand wheel isn t included with any of the kits, but it still comes out to be less (or at least competitive) and the speed of adjustment is pretty killer. Yes, installation was a snap. 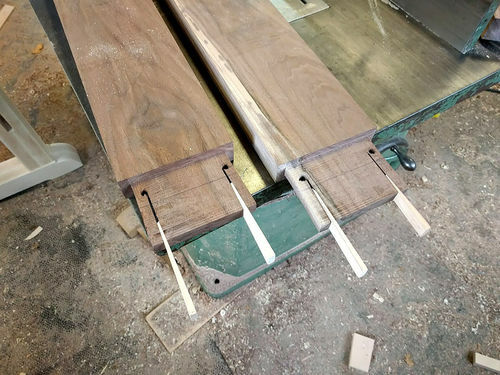 I had already prepared the cavity underneath before glue-up. Essentially one hole drilled in the end cap (instructions were a bit unclear how to locate this, but I did it manually by measuring the unit), slide the whole thing in, shim the end bearing block as necessary for the dog to travel parallel, and screw it down. Took about 30 minutes. I too was not looking forward to a big elaborate install with either LN or BC. 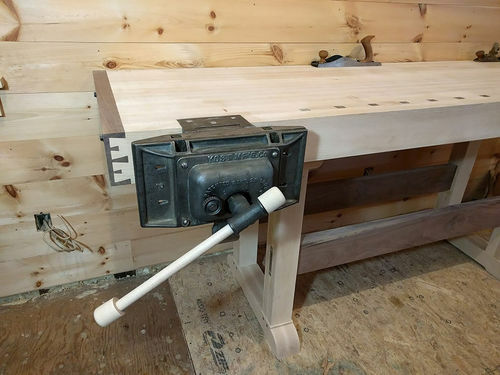 One thing worth mentioning: This vise requires either a minimum 5” apron/top, or an additional block added below in order to not have the hub hanging down below the apron. With my 5” end cap the bottom of the hub is pretty much in line with the bottom of the end cap. Excellent – good to know. Thanks!